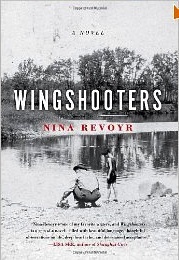 Nina Revoyr - "Wingshooters": Nina Revoyr - "Wingshooters"
Nina Revoyr stopped by the studio today to talk about her latest book "Wingshooters". With her latest offering, Nina continues her unique and affecting exploration of American racism in a concentrated novel that draws breathtaking contrasts between all that is beautiful in life and the malignancy of hate. Buy a copy of Nina's book Wingshooters in multiple formats from Amazon.